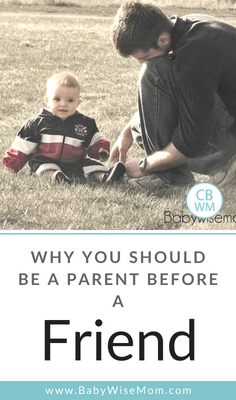 Why You Should Be a Parent Before You are a Friend to your child. Friendship comes later in life when your children are grown up. They have one set of parents but many friends in life. 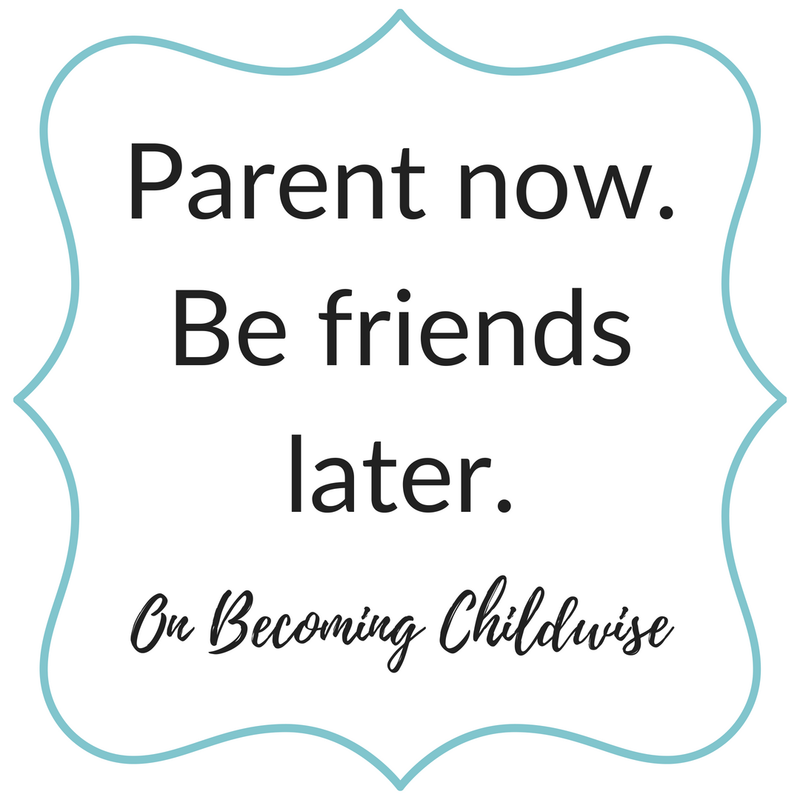 Childwise Principle #3: Parent now, be friends later. Everyone likes to be liked. Even parents want people to like them. A big fad right now in parenting is the idea to be your child’s friend rather than their parent. I can’t even guess how many times I have seen parents on TV talking about how they allow their teens to drink at home so the parent can at least monitor what is going on. I know one mom of six who lives down the street from me who is quite proud of the fact that her children and children’s friends call her a “cool mom.” Her oldest son recently shot a hole in the door of their truck with a shotgun. Can you guess what happened to him? “Don’t do it again.” That’s all. No loss of any sort of privilege. Not even a discussion of being careful with the gun or where he can and can’t shoot guns. This boy is 17 years old. The parents then laugh as they tell the story and shrug their shoulders as they say, “Boys will be boys.” Read all about why I hate the saying Boys Will Be Boys here. These parents are striving for friendship before parentship. Sure, we all want our kids to like us. We want to remain “cool” forever. Maybe some people don’t see the harm in this. I know there are thousands of parents out there who truly think it is best to be friends and not parents. Here is the innate, logical reason that is wrong: Your child has one set of parents. You and your spouse (or sometimes just you) are the only parents your child will ever have. Ever. Your child might have relationships with leaders and teachers that can be parent-like, but that still doesn’t put those people in the position of parent. Your child has aunts, uncles, and grandparents. Don’t shortchange your child or those people by expecting them to take the role of parent so you can be friend. Children need those other family relationships. They are all unique and contribute to your child. The job of a grandparent is largely to spoil the grandchildren. Grandparents and grandchildren have a special bond and relationship that can’t exist if grandparents are forced to become parents. The same for aunts and uncles. My sister always laughs about how she is going to be the cool aunt my kids go running to when they are mad at me. Your child will have lots of friends. For her entire life, she will have various friends who come in and out of her life. She will never lose the opportunity for making new friends. But you are the only shot she has at parents. Think of your own past and the many friends you have had come and go. Chances are you have a handful of friends who have been there for a long time, but many friendships fade with distance. The same is hopefully not true for your parents. Your parents are their unconditionally. Your parents love you and stick by you. Don’t take that relationship away from your children. Another problem with trying to be friends rather than parents to your children is that to do so, you must sacrifice your authority (see page 54 in On Becoming Childwise – affiliate link). Your children need you to lead them down the best moral paths. Your children need you to share your experience and wisdom with them–even if it annoys them. Your children will receive the information and instructions you give better if they respect you. The day will come that you can be friends with your children. They will mature and move away from needing your leadership and authority (see Leadership and Authority: Childwise). Again, the work now brings the reward later. Take real note of that and come to know of the truth of it. Look around you and observe the laws of nature. I believe laws of nature follow the laws of the Lord. You cannot reap rewards you did not sow. Take planting a garden. The more work you put into it, the more you get out. Sure, you can just plant seeds and see what happens. You can put a variety of levels of effort into it. We plant a rather large garden. Last year was our first year in this house where we could plant a garden. Kaitlyn was also a newborn. My husband prepared the garden plot himself, planted the seeds himself, watered himself, and weeded himself. Soon the weeds started to take over because he really couldn’t keep up himself. We got some good food out of it, but not as good as we could have if there had been more work put into it (not that my husband didn’t work as hard as he could; it was just too much for one person). After I had healed and Kaitlyn was stabilized, I was able to devote time to the garden, though not enough. The harvest came and we could hardly keep up with the weeds and the produce. This year has been vastly different with our garden. We have both been able to put a lot of time into it. I can also work on it in the day. Brayden is old enough he really helps. The garden looks beautiful and is producing well. We are able to store our excess for winter use and/or share with the neighbors–whereas last year a lot went to waste. We put a lot more effort into it from the beginning, and it has made the harvest much, much easier. I hope this analogy rings true to you. It rings true across all plants. The better you care for young, tender plants, the stronger they will be as they grow. If you have no experience with plants, try to apply it to things you do have experience with. Sports? While some people have natural talent for a sport, you still need to put time and effort into practicing before you are really good. Work comes first. Musical instruments? Again, practice, practice, practice. Do you cook? How much better have you gotten over time and with practice? Maybe your thing is education. When you put the effort in to your education, were you amazed at how learning started to become easier? Concepts that would have been impossible two years earlier were now relatively simple? Or at least doable? I know we live in times of instant gratification. In many ways, we were not raised in an era of patiently waiting. We have had easy credit, microwave ovens, and constant entertainment. If waiting is hard for you, first acknowledge that weakness and then work on it. When you feel yourself impatient with all of the work and the few rewards you are seeing at the moment, try to pull in your analogy and remember that effort must come first. Great post. My hubby used to be a Youth Minister and the thing that saddened us the most is when parents stopped parenting once their kids became teens…thinking they either needed to be their friends or that they needed their independence. These kids were practically crying out for mom or dad to guide them. My best friend had parents who could’ve cared less what she did as a teen and it made her angry that they didn’t care enough to protect her and tell her “no” at times. So true, Denise. That is common with youth. Thanks for sharing that.